Punny Monday Courtesy of Barbara! I didn’t do Punny Monday today — noon or midnight. I am sorry. I was so busy this past week I never even gave it a thought. Luckily Barbara has come to our rescue! I used to keep two or three ahead, but apparently I used them all up, too! It looks like I have another week of craziness ahead of me. I have a bunch of paid work to pound out and then a he said – she said I think you’ll enjoy. And I am hoping I’ll get to visit every one after exercise class tonight. I am ahead there because dinner is already in the crockpot and I we won’t be eating at 9 p.m. tonight — which we’ve been doing most nights this week! We’ve also had five meals OUT this week. Totally unheard of because as a rule we’re just too cheap (generally with me being the one insisting, “I can cook!”). At any rate. This coming week looks to be just as crazy as last week, but I will try to keep up! I really do miss all of you, but I have to say it is nice to have a life and I am enjoying interacting with people in real time. I didn’t realize how much I missed that in Hawaii. So, for this afternoon, banana bread making (church coffee hour next Sunday) and exercise class. Tuesday is cooking baking (for Valentine Care packages) and audio-visual training for the church overhead. Wednesday I am on the ferry and off to Oak Harbor for the day — I am hoping to get home in time for exercise class. We’ll see. Thursday I volunteer at the elementary school in the morning and am hostess for our Community Women’s Bible Study in the evening). And it looks like my calendar is free for Friday and Saturday. Shh, don’t tell anybody! Now, on to Punny Monday, courtesy of Barbara from Stray Thoughts! You all be sure to thank Barbara! I had nothing planned and she came to our rescue with this wonderful pic! Thank you Barbara…um…I think. As usual, I have no idea, but I’m thankful anyway! Quilly — I’m glad you’re staying busy with positive, uplifting things! It never crossed my mind until I stumbled across this in my reader. You’re welcome — I am glad to have one pop into mind on a day when it came in handy. Wow, Q, you do have a busy week ahead! Glad you’re finding activities and folks you enjoy. Thanks Barbara even though I haven’t a clue. I’ve thought about it all day. Quilly – have a fun week. Just popped by very late thinking I had missed Punny Monday. Thanks for rescuing Quilly, Barbara. Alas, I’m stumped by your offering. Not a thought in my head as to what it might be. Sigh. Enjoy your busy week, Quilly. Just pop in to say hello, after Melli who is blog burnt out, it seems to me that you are too ! You say : I really do miss all of you, but I have to say it is nice to have a life and I am enjoying interacting with people in real time. Since I began blogging I have always continued my real social life and real friends. I just filled my empty time with blogging, and that was perfect for me, because I was so bored !! and then I love to write. My guess is entered. Sorry you are so busy, but happy you are okay. I’m clueless (as usual) and busy, so I’m going to pass on a bad guess. That was brilliant. I just didn’t have a clue this time. It might have helped if I had a microwave from the current century…. but that’s just excuse making. I won? Wow! I thought it was wrong because there was only one display. If there had been two – End TIMES, it would have made more sense, but still, I guessed. 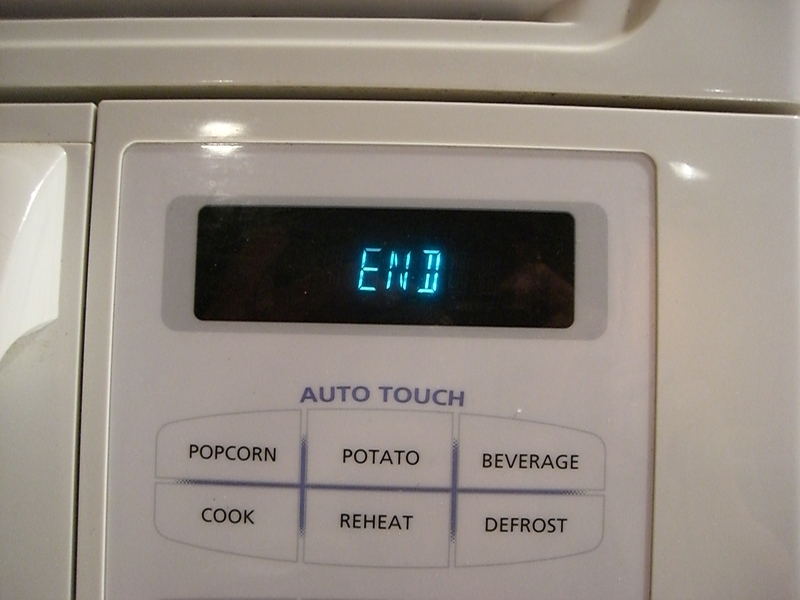 Better to see End Time on a microwave than to see END TIMES in the sky!